As we touched on in a previous article on Cork City, we quite liked the fact that Bayern Munich used to mix things up with their home kits. With red, trimmed in white, the favoured look, a bit of variation was no harm and each kit still managed to retain the Bayern ‘look’. Same, especially in the last 20 years. Always wise to listen to their fan base though. I just hope it’s not a vocal minority. We do wonder if social media has helped the campaign to grow legs, especially in light of how far Bayern went from tradition during the the 1990s, when blue was introduced to the kit and gradually grew in volume, so much so that it overtook red. As we mentioned in our 1990-91 Serie A kits series, 1991 was a significant year in terms of kit design. Bolder and brasher was the order of the day, with adidas punishing the boundaries on whether kit elements were designs or trademarks. As well as issuing Bayern with their new aggressive template, they introduced blue to the kit (a more ‘traditional’ version was worn by Bayern’s amateur team). Austin Long of Soccer Nomad has a fairly sound theory that the blue was from the Bavarian flag, which is represented on the Bayern crest. Two years later, and the design evolved, bringing with it more stripes and a further sprinkling of blue, this time on the sleeves as well. While it looks on first glance that the same shorts were used, they differed ever so slightly in the blue stripes weren’t ‘closed off’ with white trim. 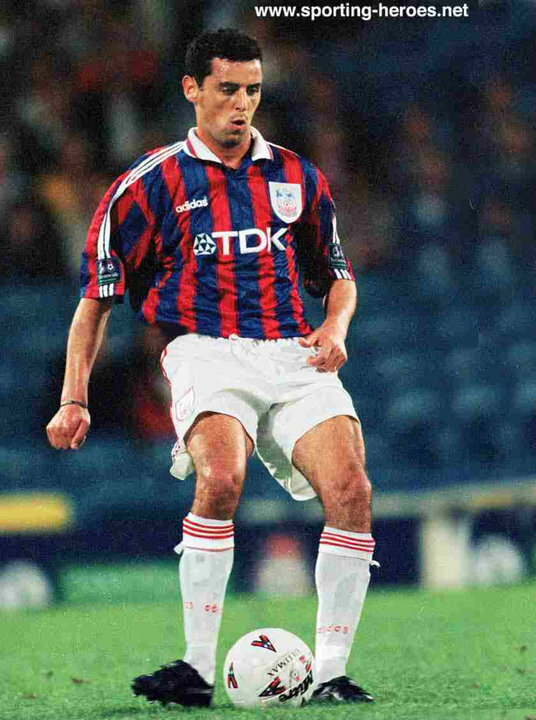 Blue and red stripes was not a completely unknown look for Bayern as it has been seen in the 1970s (and was revitalised in 2014 again), but the decision to pair the look with blue shorts and white socks in 1995 made for a very unusual visual. Pretty much exactly the same shirt would be given to Crystal Palace in 1996. While a return to something more traditional might have been expected when another new kit was due in 1997, adidas instead continued to push the blue envelope, darkening it in the process. First seen on the final day of the 1996-97 season as Bayern celebrated winning another Bundesliga, one could have been forgiven for assuming that it was a change kit, so reversed were the colours from what would have been expected. Indeed, a similar style would become the second kit for 2017-18. 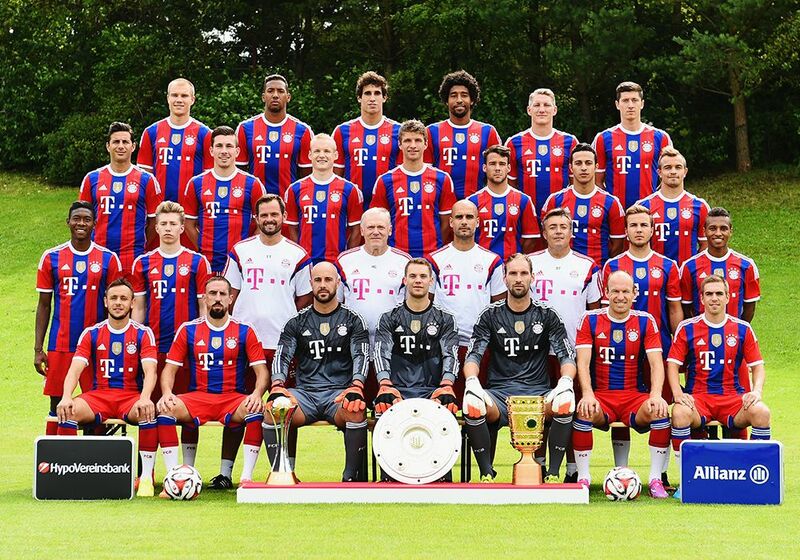 Of course, in Munich, blue had always meant 1860 rather than Bayern. For the stadtderby between the clubs during this kit’s lifespan, Bayern did turn out in red for their ‘home’ games at the Olympiastadion – a stock adidas design used by France and Rangers. When the time came for another change in the summer of 1999, the logical step – following the pattern of recent offerings – would have been to ditch the red completely and have a blue and white kit, but instead Bayern were outfitted in what, in our view, became an instant classic, right down to the hooped socks. The shirt following that in 2001 was a similar design but in a darker red and, apart from the 2014-15 kit and the red-and-white striped 2010-11 anniversary kit, red has remained dominant. That looks to now be set in stone. We’ll always have the 90s, though. Interesting announcement by Bayern. I’m not sure I can think of another big club anywhere else in the world which is as inconsistent with its colour scheme and designs.